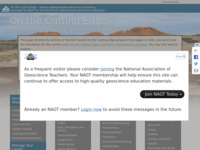 On the Cutting Edge - The On the Cutting Edge project runs a series of faculty professional development workshops every year. Topics range from preparation for an academic career to designing innovative courses to emerging themes such as teaching with visualizations and incorporating new discoveries from planetary exploration into geoscience classes. Check out the workshop schedule to get more information on this year's lineup of workshops as well as links to past workshops. InTeGrate Workshops - These workshops are aimed at developing program and course level strategies and materials to address societal issues, geosciences, and sustainability. Resulting resources include a rich collection of teaching activities, course descriptions, and essays. Building Strong Geoscience Departments - The Building Strong Geoscience Departments project runs workshops focusing on department-level challenges and strategies. Past topics have included curriculum and program design, program assessment, and student recruitment. 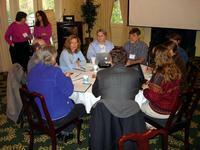 The workshop page lists upcoming and past workshops. Associated Colleges of the Midwest: Faculty Career Enhancement Project - Supported by grants from the Andrew W. Mellon Foundation, the ACM Faculty Career Enhancement (FaCE) Project has provided opportunities for faculty at ACM colleges since 2004. With renewed funding from the Mellon Foundation in 2008, Phase II of the FaCE Project supports a variety of new initiatives, building on lessons derived in the first years of activity. Use the listing below to browse through all the current workshop announcements. These announcements will contain information about each workshop as well as links to the workshop website. You can also search through all the websites from past workshops. Apr 26 2019 In this April 26, 2019 webinar, Rod Parnell and Peter Walker describe the significance of core competencies to academic programs, especially those in rapidly developing fields. They define what they mean by core competencies, learning outcomes and frameworks; report on the current state of research on key competencies in sustainability and highlight the most utilized core competency systems; present NCSE preliminary data focused on program-level learning outcomes related to key competencies in sustainability; and conclude with discussing the consensus building process and next steps in the evolution of core competencies in sustainability. Apr 29 2019 This April 29, 2019, webinar, presented by Dave Mogk, Professor, Earth Sciences, Montana State University and Mike Hochella, University Distinguished Professor, Geosciences, Virginia Tech, presents an overview of basic concepts about nanoscience, and the many ways that nanomaterials interact with the Earth system. Nanomaterials (natural, engineered and incidental) play central roles in the energetics and mass balance of Earth processes, and also have huge impacts on environmental and human health. At the nano-scale the "rules" are different, and there are many examples of size dependence of physical and chemical properties of materials that may be quite different on the nano- vs. micro- or meso-scale. This webinar summarizes the key concepts about nanoscience in the Earth system recently published in 10-page review article in a recent issue of Science: Natural, incidental, and engineered nanomaterials and their impacts on the Earth system. The presenters also provide an overview of a new website that supports teaching about nanoscience in your regular course work (e.g., Mineralogy, Geochemistry, Petrology, Hydrology, Environmental Geology....): Teaching Nanoscience Across the STEM Curriculum. We provide suggestions on "What", "Why", and "How" to teach nanoscience. May 6 2019 As the world grapples with climate change, educators have an increased responsibility to help their students learn about energy, energy systems, and the energy economy. 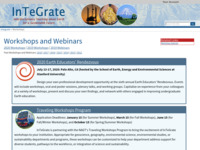 This webinar introduces Energy, Earth and Environmental Education (E4) – an emerging approach informs about energy solutions to climate change. David Blockstein (AESS) will introduce E4 and present opportunities to learn more about E4. Teresa Sabol Spezio (Pitzer College) will discuss pedagogy involved applying the complexity of energy systems so students have a way to compare and evaluate energy sources. Cornelia Colijn (University of Pennsylvania) will discuss creation of graduate programs in energy.